What recreational activities will my camper be able to enjoy? Camp recreational facilities and a planned recreation are a part of each day’s schedule. The recreational programs are arranged according to the ability of the specific age group. Recreational activities can include typical games such as kickball, soccer, tetherball, or volleyball. We also have Nine Square in the Air, carpetball, a pool table, ping pong and an old time arcade. 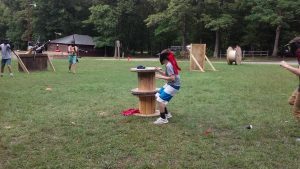 They may also include such activities as shaving cream fights (older age groups) and mud kickball and other extreme games such as BattleBOW (an arrow tag game). Please be sure your child brings play clothes to camp as they will get dirty. You may also wish to send a plastic trash bag for your child’s wet/soiled clothes. Safety is our first priority. Please note all junior age or younger campers are required to pass a swimming test before being allowed to leave the shallow end. What happens if my camper gets hurt? We do our best to ensure that Oak Hill is a fun and SAFE experience for your camper. Despite our best efforts,occasionally a camper will get sick or hurt. A camp nurse is on duty at all times. Any accident or illness should be reported to the nurse at once. In case of sickness or accident of a serious nature, parents are notified, and the child is immediately taken to the doctor or hospital. Each camper is insured by the camp’s insurance while attending camp. The camp’s insurance is secondary to any insurance carried by the camper or the camper’s parents. Any pre-existing condition will not be covered. What if my camper gets sick or has special medical needs? Someone serving on the adult staff during each week of camp will serve as the camp nurse. This individual will be responsible for treating minor wounds/injuries and administering medication. If your child is on medication which he/she must take on a regular basis, you should leave this medication (with complete written instructions on how and when to administer). An adult staff member will be responsible for collecting the medication and storing it in a safe place. If your child is experiencing difficulties at home such as anxiety over a separation or divorce, or any other situation such as illnesses in the family, it would be helpful if the acting camp nurse is made aware of these situations. This will enable us to better communicate with your child should he/she become upset while attending camp.